Written after the Marikana massacre, and using the extended family as a metaphor, this 3-person play explores the so-called “rainbow nation” and whom it works for. 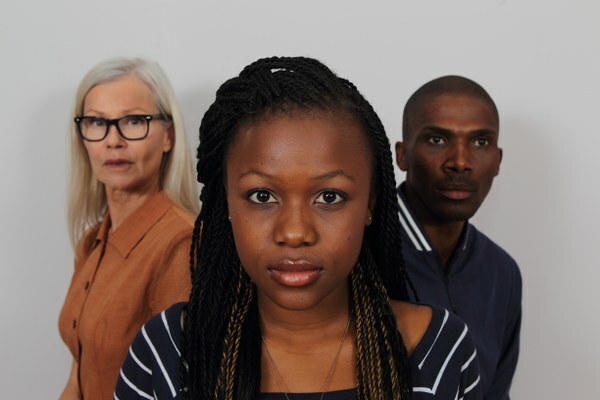 Winner of a Standard Bank Ovation Award at the National Arts Festival 2013 and nominated in six Naledi Theatre Award categories, including Best New Script. Originally, I had intended to write this play as a two-hander about a white suburban mother and her black adopted daughter. It was to explore themes of mother-daughter relationships, but within the racial polarisation of contemporary South Africa. Then, the Marikana massacre happened. The play expanded to include the daughter’s estranged cousin. And it – the family – became a metaphor through which to explore the notion of the “rainbow nation” i.e. who’s included, who’s not. So, while the ‘rainbow nation’ may include the mother and her daughter with a similar education, class and cultural background – despite being different “colours”, the cousin from a more working class background is excluded. And that is the rainbow nation – something that works for a “multi-racial” middle class minority, but not for the overwhelming majority of the country. Most – including reviewers - responded to the play at its most superficial level i.e. as a play about inter-racial adoptions, and did not see or consider the broader metaphor. The script is available on this site and from Junkets Publishers.